The 2003 Tim Burton film of Big Fish is one that I have watched many times and grow fonder of with every viewing. I know it well, and so my response may be different from someone coming in blind. For those who are unfamiliar, the story centres on a father and his adult son – Edward and Will Bloom – and Will’s frustration with his father’s constant need to be the centre of attention and tell endless stories that mix fact and fiction. With Edward taken ill, the pair have limited time to reconcile their differences, and throughout the show, we flashback to earlier moments in Edward’s life and his incredible journey. John August, who wrote the film screenplay, returns to write the book for the musical, and while some sections transfer over very well, others are a little muddled and messy. The constant switching from present day to the fictitious past is naturally trickier onstage than in film and this is done more successfully at some points than others. Director Nigel Harman makes every effort to display magic and wonder in this story, finding interesting and elaborate ways of using trap doors, hidden cupboards and other tricks added into Tom Roger’s set design, but the end result still falls short of capturing the fairy-tale feeling of the film; in addition, when in the past, the musical sometimes treads very close to pantomime, but just about stays the right side of the line with its tongue-in-cheek nature. The present day sections transfer much more smoothly to stage, and, in part down to the stellar cast as well as the book, are full of raw and real emotion (it is a bit of a tearjerker). One gripe I could not shake with the musical adaptation, however, is why there was the need for singing in the real-life modern day sections. Musical theatre is a perfect tool to heighten reality and tell a story, so the songs feel incredibly natural in the scenes that are set in the past but are a little out of place when things switch back to real life. 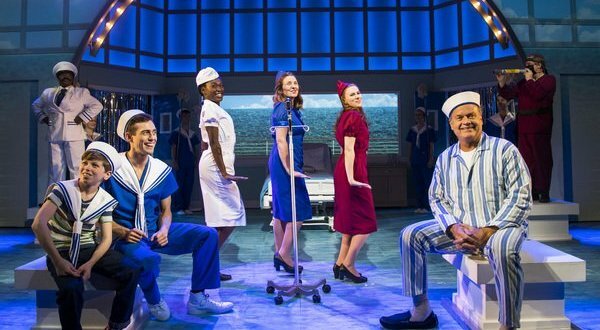 Kelsey Grammer (from Frasier if you’re trying to remember), is the star name in this London transfer, and the actor certainly does bring an air of stardom to the stage. He encompasses the arrogance, boastfulness but overall caring and loving nature of Edward Bloom in his later years, while being an encapsulating storyteller to his audience on and off the stage. The biggest strength in this show is his relationship with Matthew Seadon-Young, who plays Will Bloom. Together they demonstrate multiple levels of a complex relationship and ensure that you are on the side of both characters during their feuds, longing for the outcome to be resolved. The climax of this relationship towards the end of the musical is a particularly special moment. Clare Burt and Frances McNamee playing the pair’s respective partners also provide well-rounded performances in these present day scenes, which for me were the strongest sections of the show. That being said, there is still fun to be had in the fabricated-past scenes. The large supporting cast put heaps of gusto and comedy into a host of weird and wonderful characters who the lead protagonist meets on his journey through life. Jamie Muscato plays young Edward with all the charisma and sickly sweetness needed when playing a heightened version of an already assertive character. His slick and confident commanding of the stage and impeccable vocal ability during some of the bigger numbers prove he is rising star of the West End. Overall, this musical adaptation won me over, and had me laughing and crying on multiple occasions. However, I did still have my problems with it. The script, which apparently had been tweaked following its Broadway run a few years back, does not flow smoothly and some parts feel rushed while others a little slow. Andrew Lippa’s score is pleasant but lacks memorable tunes, and as I’ve already mentioned, the decision to add music to the modern day scenes as well as the fictional stories seemed a misstep to me. I did enjoy the show and think this production has a lot going for it. More than anything, however, it has made me want to rewatch the movie, which still ranks way higher in my mind than the onstage version.